Peace and solitude is what I like about backcountry skiing and snowshoeing. Travel with a friend and take plenty of food and water. Take your cell phone (It may work some or all of the time depending on where you travel) and leave plenty of time to get back to your car before sunset. Oh yea, don't forget to bring your camera. Up to 6 miles of logging roads off Cabin Creek Road. These are gentle slopes near the regional dump off Hwy. 89 south of Truckee. The trailhead is 1 mile off the highway on Cabin Creek Road. From Truckee take Highway 89 South for approximately 7 miles. Across the street from Big Chief is a parking area where Forest Service Road 8 begins. Your should see the confluence of Pole Creek and the Truckee River. Park on the west side of the highway. The mostly flat park is open all year long with beautiful lake side views of Donner Lake. There is an unmarked trail that starts near the Emigrant Trail Museum. The park roads are sometimes groomed for cross country skiers. You can also enter the Cold Stream Canyon trail system from here. Park off the south end of Cold Stream Canyon Road if the gate is open. Park near the gate if closed. This is a 4 mile loop with one hill in the first 1/2 mile. This is a great running trail in the summer andgreat for skiing and hiking in the winter. From the Castle Peak exit at Donner Summit, drive north on the road for 1/2 mile to the trailhead. The trail is a gradual uphill for several miles. The trail is unmarked, but there should be plenty of tracks to follow on this popular route. When you reach the ridge, Peter Grubb Hut is north and the Peak is obvious to the south. The trailhead is 8 miles north of Truckee on Hwy. 89. Turn left on Sage Hen Road towards the Sagehen Field Station. Skiers or snowshoers can continue up Sagehen following the #11 Road west for several miles into the high basins under Carpenter Ridge. You can also follow the #11-8 Road further west to the top of the ridge. From just above the campground, you can also loop back east using the #11 Road to return to the Summit parking area on Highway 89. Total loop from Highway 89 is about 6 miles. The park is 9 miles south of Tahoe City on Hwy. 89. There are several miles of ski/snowshoeing trails that begin at the campground. There are beautiful views of Lake Tahoe. The trailhead is on Hwy. 89 opposite the Meeks Bay Fire Station. Follow the U.S. Forest Service road through the meadow and down to Meeks Creek. Park at the Kaspian Recreation Area off Hwy. 89 south of Tahoe City. Hike or ski through the meadows or continue up the unplowed road toward Barker Pass. This area is open to snowmobiles as well. Brockway Summit is on Hwy. 267. 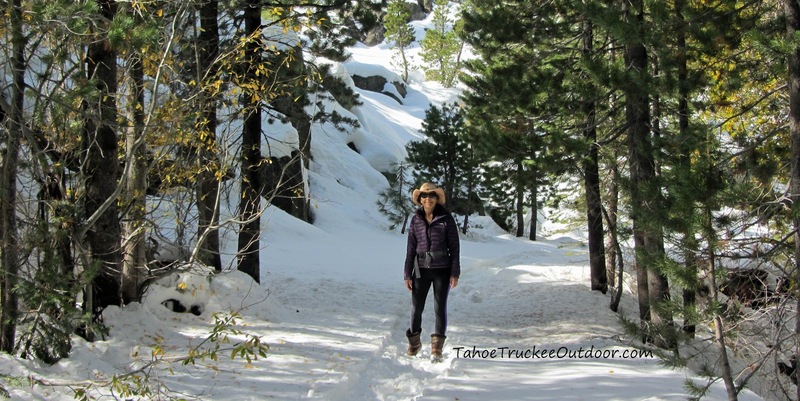 There are turn-outs on both sides of the road south of the summit for the Tahoe Rim Trail, which offer miles of ski/snowshoeing east or west of the highway. A second area is at the summit on the west side of the road. There are miles of fireroads to explore. There is a third parking area on Martis Peak Road, which is 1 mile north of the summit. This area offers several miles of exploration on skis or snowshoes. Martis peak offers magnificent views of Lake Tahoe. Page Meadows is a popular destination for hikers and bikers year round. Take Hwy. 89 south from Tahoe City. Turn east on Pine Avenue and right on Tahoe Park Heights Road. At the crest of the hill, take the middle fork, which becomes Big Pine Road, then turn left on Silver Tip. Park at the end of the road and begin. The starting elevation is 7,000 feet. Page Meadows is a series of small meadows. Some parking areas are designated State Sno-Park sites that require a Sno-Park pass to park. Passes can be purchased on-line. Check with the Sierra Avalanche Center if you plan on traveling in the backcountry, particularly after a big storm. The Center will advise you of the avalanche risk.